Luchadora is an online casino game created by Thunderkick software. 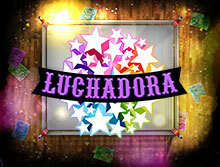 Luchadora is a Mexican wrestling-based slot game which has 5 reels along with 30 paylines. Luchadora has a lot of entertainment factor in store for all the players. As you unravel the game you will identify that this game is filled with great graphics, a nice storyline to go along, and much more. Thunderkick has filled all of its great features in this game as well. The game has funky characters which are wrestlers like El Toro and El Rayo. Like every great game offered by Thunderkick, this game is compatible with all the operating devices as well. You can smoothly run this video slot on every electronic device. Luchadora presents you the inspiration taken from Mexican wrestlers, which is very entertaining. It even delivers perfectly on graphics and user interface. So when it comes to RTP or “Return to Player”, one may wonder if the same applies. The RTP of Luchadora is 96.2%, which in our opinion is low and Thunderkick could do better by working on this particular element. The maximum win or jackpot is not that great as well. If in luck you avail a jackpot, it will be 2.5x more than your existing wager. Another thing to know about Luchadora is that the range of coin size you can play with it is 0.1 which can go as high as 100. As already mentioned, the theme of this game is derived from Mexican wrestlers. So, you will definitely find wrestling inspired symbols. The basics of this game include 4 wrestlers. These 4 elements can also be changed into wild symbols. These 4 wrestlers here are El Toro (he is the one in pink) and El Rayo (he is the one with orange getup). The other ones are El Serpiente (he is the green one) and El Pantera (he is the blue one). These 4 symbols are the star symbols of this wrestling inspired game. Along with these 4 stars, you will see Misterioso Campeon as well as La Luchadora. Some symbols which are of relatively lower values are some Mexican veggies like chilies and pepper and more similar ones. The other bonus symbols of Luchadora are the Lucha Bonus and the Lucha Smackdown. Lucha Smackdown: When you trigger the Lucha Smackdown element in your reel, you will avail a few incentives like the Free Spins or an additional Multiplier. You may even be able to avail extra spins from 7 to 15. The multiplier that you may be able to avail will range from x2 up to x15 more than your initial stake or wager. If you trigger the Lucha Smackdown, then you may even get the Wrestler Wild transformation. Lucha bonus: Lucha Bonus of Luchadora is operated on the symbols of the winner’s belt. To trigger this bonus you need to land at least 3 winner’s belt bonuses. 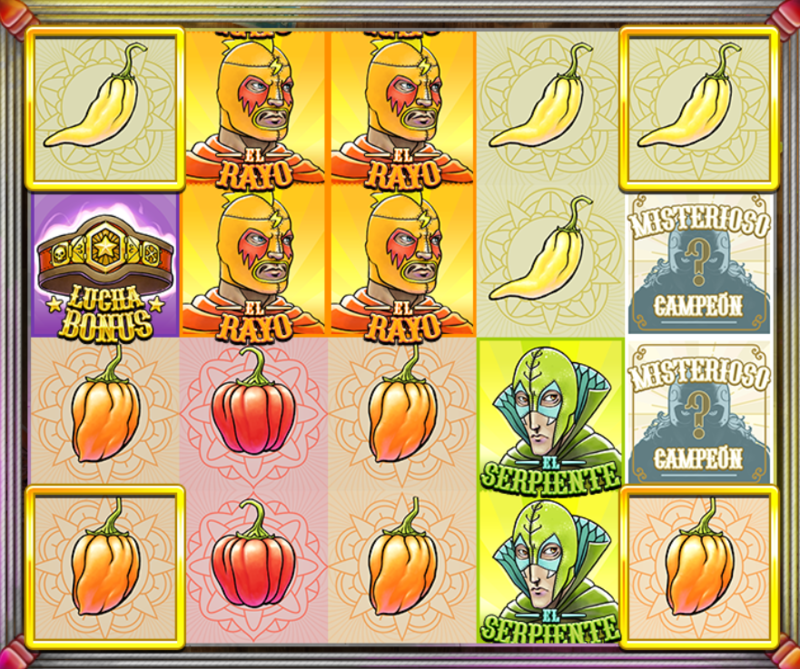 If you do land 3 or more than 3 winner’s belts then you will be able to avail free spins as a part of the Lucha Bonus. If you get more than 3 of the winner’s belt, then you can avail the Lucha Free Spins bonus. The amount of spins you avail will depend upon the symbols you used to trigger the bonus. You can expect from 7 to 15 free spins. Ring Corners: Ring corner is a feature of Luchadora which triggers when a wrestler symbol appears in either one of the corner positions of the reel. When this happens, the game automatically turns the symbol into the wild. It also turns other similar wrestlers’ symbols in the vicinity as wild. If a wrestler symbol turns into wild due to any reason, this transformation will stay constant as long as you don’t spend all of your free spins present in the game. If all the present wrestler symbols in the game get transformed, then the underdog symbol will turn into the La Luchadora symbol. If all the 4 symbols of wrestlers get converted into wild symbols, then the Misterioso Campeon symbols will be substituted by the La Luchadora symbol, which is more valuable in comparison. These are a few tips which will help you understand the functioning of this game as it can be slightly confusing sometimes. Luchadora lives up to the reputation of Thunderkick. The game is highly entertaining and creative. It is definitely worth a spin with its fun and varied elements. The video slot has plenty of excitement and fun in store. However, the fact that the RTP of this game suffers is a shortcoming. The game is of medium to high variance which means that you may want to remain careful while gambling. The bonuses of this game also lack in quantity. Thus with the high variance and the lack of bonuses, the game has less RTP. However, all in all, the game is decent and definitely worth a roll.